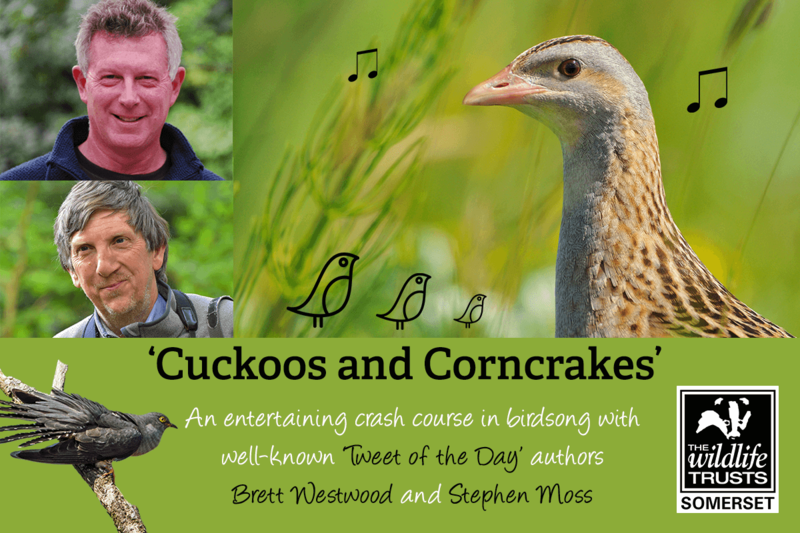 A lively and entertaining fundraising evening that will literally open your ears to the fascinating world of birdsong, brought to you by well- known Tweet of the Day authors Brett Westwood and Stephen Moss. Between them Radio 4 presenter Brett Westwood and Springwatch producer and President of Somerset Wildlife Trust Stephen Moss, have spent over a century observing and listening to birds. Their bestselling book Tweet of the Day, based on the cult radio series, is packed with hints and tips on how to tell your Corncrake from your Curlew and your Blackcap from your Whitethroat. In this aural extravaganza the duo provide a crash course in birdsong complete with bizarre sounds, curious anecdotes and fascinating facts, suitable for both novices and avid birders of all ages. The event as well as celebrating one of the great wonders of nature; the variety and beauty of British birds and the sounds they make; will raise vital funds for Somerset Wildlife Trust and their work of safeguarding the county’s wildlife and wild places, and encouraging everyone to enjoy and appreciate the natural world around them.